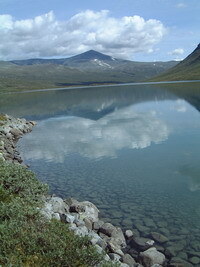 When we studied the map from Jotunheimen we discovered that some of the routes were unexplored by us. This could not be accepted. A walk round was planned where we also celebrated our 10-year anniversary. The whole trip characterized by sun shine, warmth and calm air. Not what we had expected. Below you can see the day trips for this hike. Select the day you want to read more about by clicking on the day tab at the top of this page. If you want to se a map, just click on the map tab.